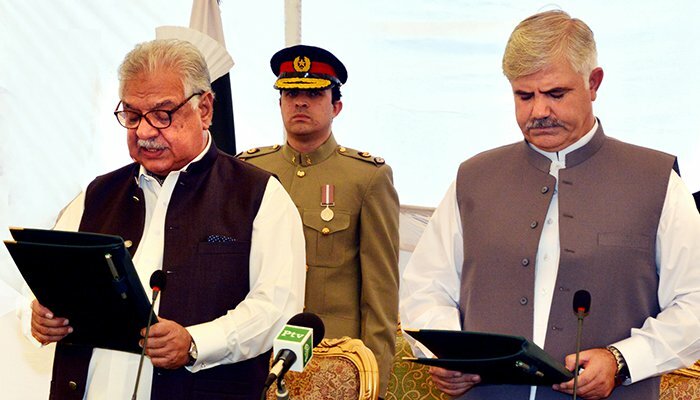 PESHAWAR: Khyber Pakhtunkhwa (KP) Chief Minister Mahmood Khan proposed 11 names for the provincial cabinet and forwarded a list to Prime Minister Imran Khan for approval on Sunday night. The finalised names comprise representatives from across KP, including Peshawar, Mardan, Swabi, Malakand, Swat, Bannu and Lakki Marwat to ensure equality among all areas, a senior member of the Pakistan Tehreek-e-Insaf (PTI) said. “The list has been sent for Imran Khan’s final approval and it will be decided in a day or two,” the source added. Earlier, sources said that CM Mahmood aims to build a cabinet comprising new and old faces, however, members of former chief minister Pervez Khattak’s cabinet are lobbying for new portfolios. Former education and energy minister Mohammad Atif Khan seeks a new ministry while former health minister Shahram Khan Taraki is unwilling to lead the same department. As Atif is inclined towards finance or tourism and sports ministries, Taimur Saleem Jhagra is being considered for the ministry of education. Kamran Khan Bangash’s name has been proposed for the ministry of information. Ishtiaq Umer, however, is willing to retain to the ministry of environment and forestry.